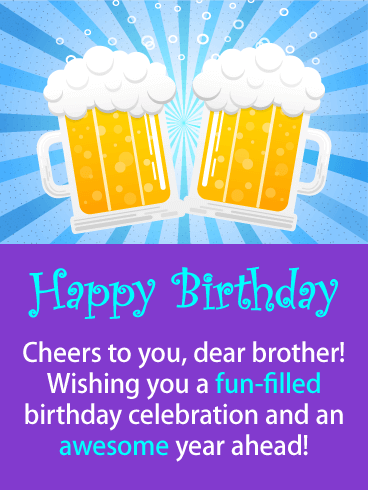 Propose a toast and say cheers to your brother on his special day with this awesome birthday Card! 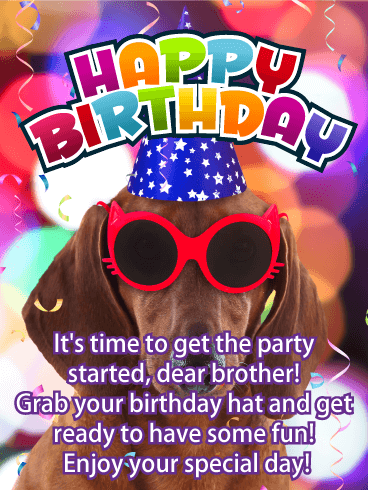 It will wish your brother a fun-filled celebration because everyone likes to have some fun on their birthday! This greeting card showcase two perfect beers with a creative blue background that only adds to its festive look! So get these two beers over to your brother soon while they are still chilled! Happy Birthday - Cheers to you, dear brother! Wishing you a fun-filled birthday celebration and an awesome year ahead! Having trouble picking a birthday card for your baby brother? Look no further than this gem! The picture in the background is faded enough to make it a perfect fit for any sibling duo, while the sentiment is sweet enough to relate to any family. 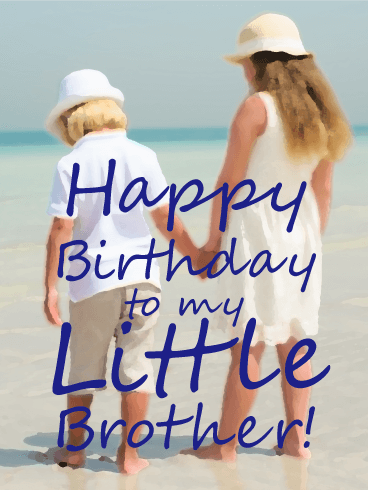 Customize the inside of this birthday card to make it suitable for your little brother on his birthday. He's bound to love it! 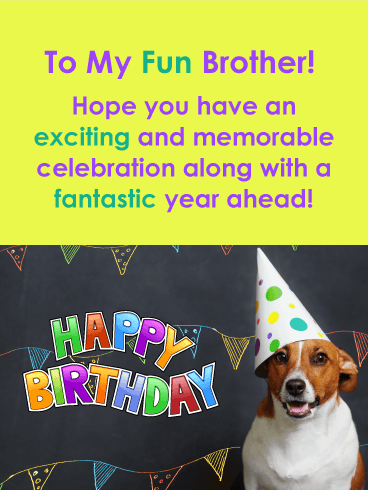 Send a birthday card to your brother that is bursting with excitement! This spectacular greeting card will grab his attention the moment he sees it! It sports exceptional colors and fireworks that add a festive element! Your brother's birthday will certainly get started with a big smile. Let your brother know you think he is fantastic and worthy of such a great birthday card. He will appreciate it! 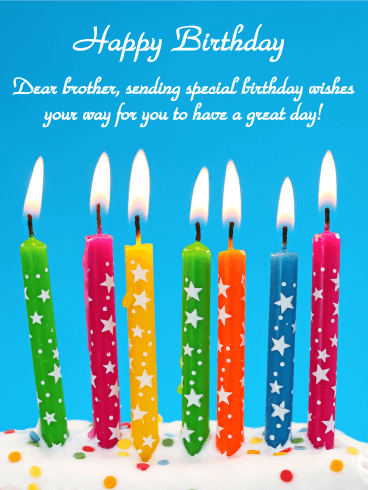 Send a bright and colorful birthday card to your brother that will add a little joy to his big day! This exceptionally vibrant greeting card will wish your brother a great day! It features wonderful birthday candles sitting atop a frosted birthday cake! Your brother will appreciate the fact that you are sending him the very best. Send these birthday candles over to your brother while they are still lit! He is going to just love this birthday card! Brothers are wonderful to have in our lives and this birthday card expresses that. It lets your brother know that you think he is a great friend and that you appreciate him. He will love hearing this on his birthday! Your brother will also enjoy reading that you feel he is a one-of-a-kind! This message will truly be the best birthday present he can receive. 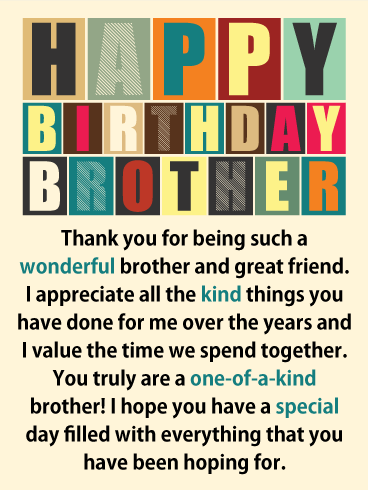 Send this birthday card on its way to make sure your brother has a special day! When you see birthday steamers you know its time to have some fun! 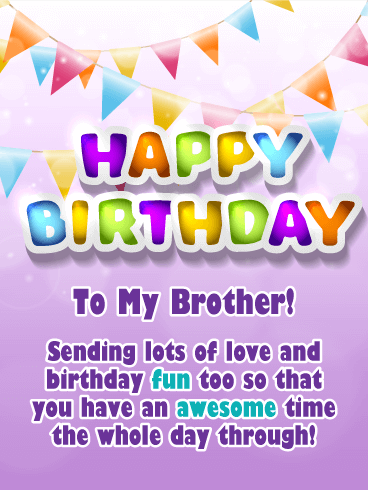 This birthday card was created just for your brother so that you can send some love and fun his way! The festive streamers and vibrant Happy Birthday lettering give this greeting card an element of celebration! The message will let your brother know you would like him to have an awesome day! 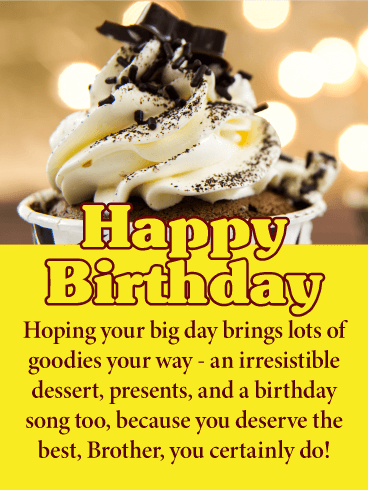 He will certainly love the fact that you sent this birthday card his way! The image on this birthday card says it all! 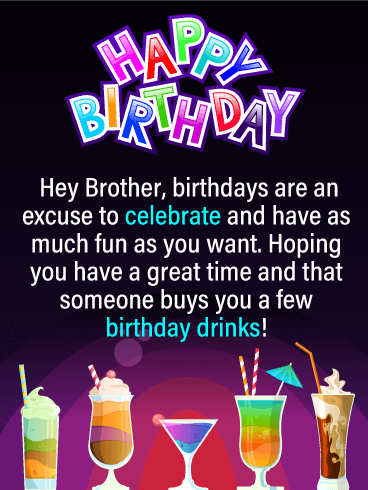 Exceptional party drinks being held up in a toast to your brother's birthday is a great reminder to live it up and enjoy the day to the fullest! This sensational birthday card features wonderful colors and fancy Happy Birthday lettering that give it a sophisticated, yet creative look! Send these perfect drinks over to your brother to help him get his birthday celebration started in style! 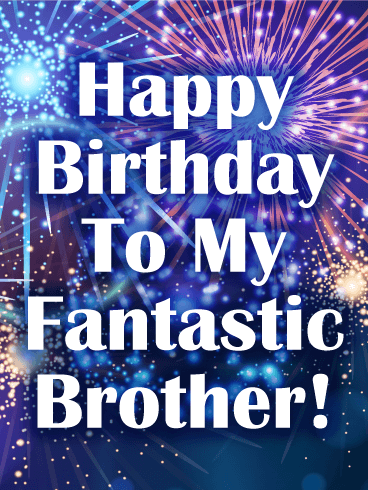 Send some presents your brother's way with this fantastic birthday card! It features awesome colors and words that will make him wish every day was his birthday! The gifts are perfectly wrapped and will give him a preview of what he has to look forward to during his birthday celebration! 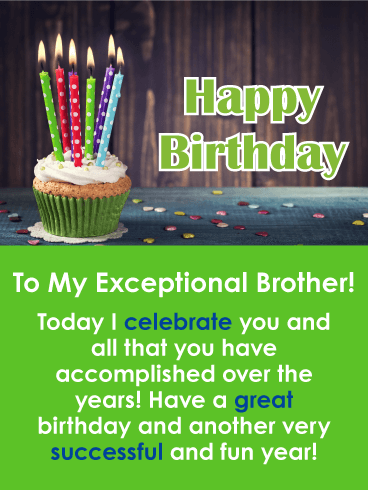 The best part of this birthday card is that it will remind your brother that this day is all about him! This will certainly make him feel special on his birthday. If your brother is the type that loves to celebrate on his birthday, then you are in luck! 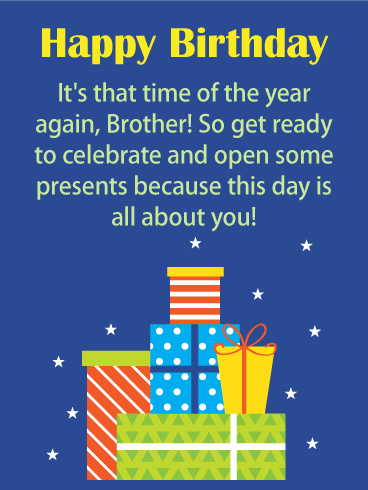 This festive birthday card will be welcomed by your brother as he is reminded of the good time that awaits him! Colorful party drinks decorate this fun birthday card with a stylish flair, making it perfect if only the best will do. 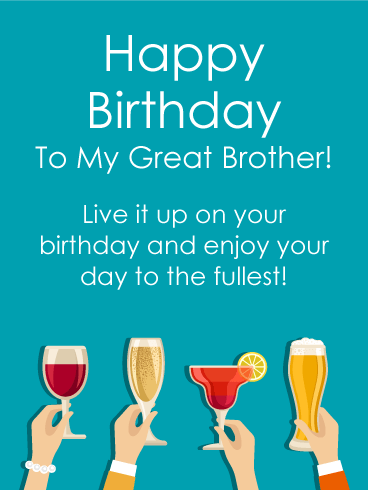 Wish your brother a great time and let him know you are hoping he receives some free birthday drinks on his big day!